The AntPro® Ant Control System, kills and destroys entire ant colonies, not just individual foraging ants. Its patented round-the-clock, feed-on-demand, liquid bait delivery capability is proven effective against carpenter ants, imported fire ants, Argentine ants, white footed ants, crazy ants, as well as numerous other ant and insect species. The most important fact to keep in mind is that AntPro accomplishes its task without broadcasting pesticides that sacrifice your health and our environment. The systems effectively eliminates imported fire ants, Argentine ants, Big headed ants, carpenter ants, white-footed ants, pharaoh, crazy ants, acrobat ants, odorous house ants, cockroaches, earwigs, and numerous other problem insect species. 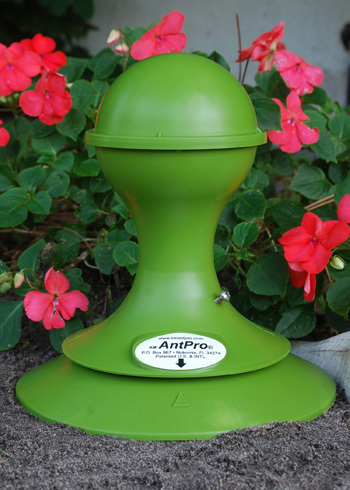 AntPro is a high-volume, weather-tolerant, liquid ant bait dispenser designed to deliver low-toxic ant bait solutions which are a combination of insect attractant and slow acting toxicant. The AntPro ant control strategy is essentially the warfare strategy described by the 4th century B.C. Chinese general Sun Tzu, in his well known text "The Art of War". The strategy works well with social insects such as ants, because it fully exploits their behavior and biology. Thus the skillful leader subdues his enemies without any fighting. When you consider the damage done by certain ant species, you quickly realize comparing ant control to warfare isn't much of a stretch. For example the Imported Fire ant currently infests over 300 million acres from Florida to California, and is responsible for death and injury to humans, domestic animals and wildlife. It provides a good example for how the AntPro strategy works. First AntPro entices its quarry with Baits: By placing AntPro in areas where fire ants forage, they aggressively feed on the bait leaving positive (pheromone) trails for other workers from their colonies to follow. Next AntPro uses deception: The bait is liquid. The fire ants consume the liquid, and then return to the colony to feed other workers, soldiers, the young and the queens. The low-dose toxic bait affects the ants slowly over a period of several feedings. The fire ants are unaware and unprepared for the subtle attack, thus the soldiers do not exhibit alarm pheromones which warn and stop the colony members from feeding on the attractive food source. Over a period of repeated feedings, the colony is destroyed, thus the skillful leader subdues his enemies without any fighting. Venice Pest Control, Inc., a Venice, Florida based family-owned company since 1974, has been providing Sentinel to their customers since March 2005. The system has greatly reduced the need for return visits between services. Their customers, individual homeowners, condominiums, businesses and community associations enjoy 24/7 continuous pesticide free non-invasive insect protection. Call or email us today to find out how Venice Pest Control can solve your ant problems.